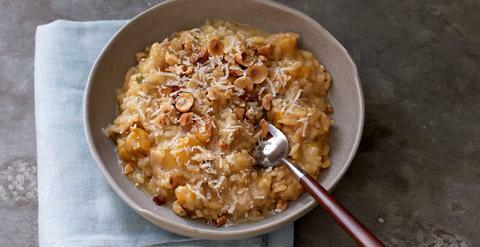 Chobani has outdone themselves with their Pumpkin Risotto. Though it is perfectly tasty enjoyed solo, we recommend pairing it with friends in front of a warm, cozy fire for the full effect! In a large pot melt butter over medium heat. Add oil and onion and cook until the onion is soft, about 5 minutes. Stir in the pumpkin (or squash) and cook until browned, about 8 minutes. Stir in the garlic, sage and salt and once fragrant, add rice. Cook until rice is opaque, about 2 minutes, and then pour in wine, cooking while stirring, until the wine is evaporated, 1-2 minutes. Slowly begin to stir in the vegetable (or chicken) broth ½ c at a time, stirring between each addition until the broth is mostly absorbed, about 20 minutes total. Stir in Chobani and ½ c Parmesan. Serve with remaining Parmesan and hazelnuts on top.